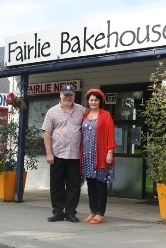 Fairlie Bakehouse believes fresh is best! They make everything on site that day and pride themselves in sourcing local produce where ever possible . They are passionate about exploring interesting pie flavours, which has lead to the creation of the famous ‘Lieber Pie’! As for sweets their cronuts, apple crumble, raspberry cheesecake and cream buns are to die for. Behind this ‘foodie’ heaven is Franz Lieber and his wife, Christine. 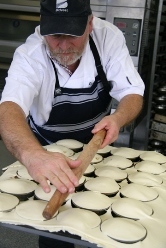 As an internationally trained chef with more than 40 years experience, Franz loves to experiment. If Franz acquired a box of pencil thin asparagus or a crate of still salty oysters the previous day you can be sure the lights at their brand new commercial bakery nestled behind the Bakehouse will have been on all night – with Franz concocting a pie with flavours that will make your taste buds sing. So what makes a Lieber Pie so special? Hand-filled, so the inside is always what you hope for. 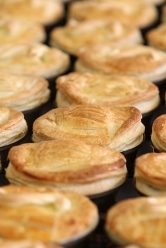 Lieber Pies are available at a number of outlets across South Canterbury with moves afoot to expand the distribution. Keep an eye on their website www.liebers.co.nz for news of new suppliers. Meanwhile, pop into The Fairlie Bakehouse at 74 Main Street, Fairlie to stock up on pies or just ring them on 03 685 6063 to arrange a delivery or order online.